Nothing looks better than a nicely planted pond, a mass of leaves and some of the most beautiful flowers available to the gardener. Visits to your local aquatic retailer will reveal a plethora of great plants and you just want to have them all but, which are suitable for your pond? And where do you put them within the pond? Not all plants stocked in the pond plant section of your local retailer are even pond plants, some are garden plants that like moist soil and will survive a limited time in the pond but eventually drown. 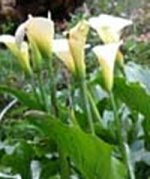 The Arum lily (Zantedeschia aethiopica), though more of a garden plant, likes to keep its feet in the water and so, if the water level comes no higher than the top of the pot, preferably a few inches lower, the plant creates a brilliant display for the pond with bright green spade shaped leaves and a trumpet shaped flower or pure white with yellow stamen. Though thought of as a funeral flower this should be looked past and this plant is one I always have in ponds I plant. A definite choice as a specimen plant (a decorative plant used lightly amongst the background plants). 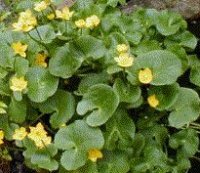 Another of my favourites is Marsh marigold or kingcup is an ornamental plant that also has good water purification properties and provides cover for aquatic life. 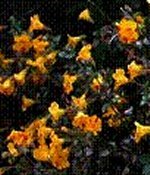 It has large light green leaves and lots of yellow flowers, which appear from April to June. It provides good water purification for its growth. It is great cover for both aquatic and terrestrial animals. If allowed to grow to full size, it covers the surface for a good foot around its pot. Monkey musk is a very odd name for such a pretty and useful plant. It produces a great display of yellow flowers June to august sometimes earlier. Monkey musk grows vigorously removing plenty of nutrients from the water as it does so; it also provides cover for aquatic and terrestrial animals whilst it covers ground and water. Needs keeping under control but every time you prune it removes nutrient from the water, which is great. The chameleon plant has great colours the one more common in the trade is the variegated species, which is either a golden yellow with red or green. Its leaves give off a scent of orange peel when brushed against and it has lovely small white flowers in the spring. This plant grows well even into drier area of the garden and out into open water like the monkey musk the more you prune it the more nutrient is removed. For larger ponds you cant beat the reedmace, which is mistakenly called the bullrush, which is a short spiky grass not attractive and very invasive. The reedmace is excellent at removing waterborne nutrients from the pond. Many animals find shelter among the stems and you can also use the seed heads, dried, in flower arranging. Lilies of various species are great for a pond. The species depending on the size of pond and preferred colour. Colours come in whites, pinks, reds, coppers and yellows. Different species like different depths of pond and produce varying amounts of leaves and blooms. 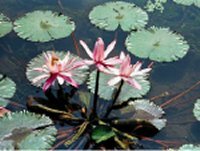 Lilies are great at covering the surface of the pond to prevent algae and the cover provided makes your fish feel more secure . Hornwort is a oxygenating plant and unlike other oxygenators, is free floating. It is the hardiest of oxygenators and survives where others will not even sometimes in ponds with hungry koi. Like other oxygenators it grows well so is good for the water and provides cover for fish and other life, but unlike other oxygenators, because its free growing you can pull it out with a rake making maintenance easier. Like the monkey musk, the yellow skunk cabbage is another unfortunately named plant. Named as its said its blooms smell badly to attract flies but this is unsubstantiated really, and gives this lovely plant a bad name. Growing to about two feet tall it has light green oval leaves with freckles. The flowers, which appear in the spring, can be quite large almost as long as the leaves themselves, which as stated grow, to about two feet. A fully-grown Yellow skunk cabbage is quite an impressive plant and makes a great specimen plant for the pond or bog garden.